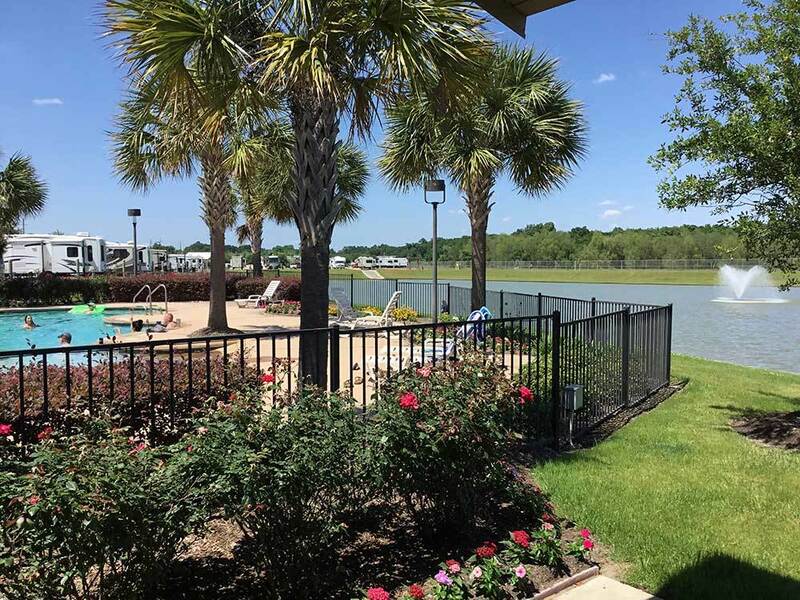 Westlake RV Resort is a 5-star residential RV Resort sporting a sparkling swimming pool & Jacuzzi, a broadband-connected computer room, professional-grade laundry facilities, exercise equipment & so much more. Wide streets for turning. Sites are spacious with concrete pads. Very impressed. We are so pleased that you that you are very impressed with our Resort. Thanks for highlighting our wide streets and our concrete spacious pads! It's a nice enough park, but our problem was that they put us right across from 4 LARGE dumpsters. All day long and late into the evening people are stopping to dump their trash. Then very early Monday mornings you get woke to the sounds of the truck dumping four large dumpsters. Then for most of the rest of the day you get to take in the smell of putrid garbage, as well as walk through the slime leaked out of the dumpsters. Since we reserved the site for a month, after about 10 days of this I asked if we could locate to another site. The woman and man in the office were very friendly and told me we could the next day when the site would be open. Unfortunately the next day we had a hard freeze with 1/8" of ice over everything and couldn't bring our slide-outs in. On the next day I went to the office to make sure the new site was still available. This time the park manager (lady) was there and she told me absolutely not! I explained that the other people told me we could and she said, well they shouldn't have told you that. Because of her very unfriendly nature, I commented; well if that's the way you handle things then we won't be staying here again. Her reply: That's fine... If you decided to stay here make sure you're not assigned a site (172-178) across from the dumpsters! Whoever laid this park out should not have put sites immediately across from them. We are sorry to hear we did not meet the expectations to your satisfaction. Our goal is to always accommodate a guest, when possible. We will work to do better in the future, and use this as a training opportunity. Very nice campground, level cement pads, nice landscaping, extra parking for tow vehicles. Laundry room was nice, that was the only common area we used. Had a lakefront lot, nice view. They did not have a fenced dog park but there are gates that let you out to the riverfront where the dogs can roam. Only inconvenience is the front gate takes a code and if they do not have any remotes available and nobody is coming out when you are coming in then you have to get out of your car and type in the code. We usually caught someone passing thru and piggybacked, not a major issue. We asked for a late checkout and they were very accommodating. Grocery store and McDonald's around the corner. Restaurants and shopping about 5 miles away in Katy, plus all of Houston is convenient.